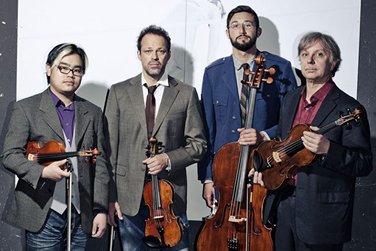 Internationally acclaimed veterans of contemporary music, Sirius Quartet creates unforgettable musical events that combine exhilarating repertoire with unequaled improvisational fire. The group’s forward-thinking, multi-genre approach includes collaborations in post-rock, avant-jazz and electronic music. Having premiered works by the likes of Phil Kline, Uri Caine and Richard Einhorn, Sirius pushes beyond the conventional vocabulary of string instruments with bold, original works by its own members, incorporating improvisation, extended techniques and undeniable grooves. These conservatory-trained performer/composers shine with precision, soul and a raw energy.